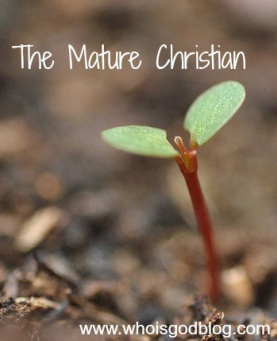 Is Christian maturity really all that important to God? It may be just a tad early for some plants, but I am desperate to start my seeds indoors. This winter’s been the longest yet it seems, and at the end of March, I still could only count the signs of spring on one hand. I’ve poured through my seed catalogs, looked through last year’s remaining supply, and even brought my five-foot seed growing stand out of the barn and on into our sun room. Starting seeds indoors is a bit of therapy for me, I think. Not only does it give me the opportunity to pick new and unique plant varieties, it lets me get my hands dirty again. And best of all, I get to see things grow. There’s always a sense of excitement when I see a bit of green poke up out of the peat in my rows of Styrofoam cups. I guess it’s a sense of triumph, a fist in the face of old man winter you might say. I like to watch my little plants’ growth and look forward to the day when I get to bring them outside and plant them in garden soil that’s perfect for their needs. Before long their roots catch hold, their stems grow thick and they begin to produce healthy foods for our dinner table. Growing things are always a wonder to me, and since God created the earth, I’m guessing he enjoys it as well. To me, growth is a symbol of hope and a pretty bold statement that life is supposed to go on. When a person becomes a Christian they are kind of like those little seeds in my starter cups. They sport a new and tender faith that needs nurtured in order to grow. Roots become stronger as the person becomes grounded in God’s Word, and stems become sturdy as the storm winds of life causes the new believer to lean on God for strength. And the exciting thing is that the Christian’s potential for growth has no limits. Each day we grow – we’ll find God to be bigger, as C.S. Lewis once wrote. But as a gardener I know that healthy growth doesn’t always happen for every little plant. Some succumb to different problems and simply wither, and others become stunted and never seem to get any bigger. And sadly, I know that this happens to Christians as well. Some fall away from the true path and discard their faith. And others hang on, but never seem to get anywhere. I love to see pictures of evangelist Billy Graham throughout his life. To me, they represent an upward path of continual spiritual growth in Christ that even today bears fruit. Recently, I read an article by Billy Graham in “Decision” magazine where he shared some solid truths on spiritual growth and how to attain it. In the article, Graham said that maturity in Christ is something that all of us should work towards. It’s not for just a chosen few that may be standing in the pulpit. But it’s for you and me too, wherever our paths may lead. Every area of our lives under his control? Now that’s a pretty high demand isn’t it? I’ve heard my pastor mention this same thing. He says that at one point in his walk with God he was willing to give God 90+ percent of control, but it wasn’t until he gave it all up to him that his relationship with God changed. Graham said in the article that he is still learning. In church on Sunday, we had two people come up to the altar after receiving Christ as their Lord and Savior. It was such a tearful moment to see those brand new Christians praying there. It was a scene of new life, new growth and brand new potential for the two to flourish and mature in Christ. God’s clear-cut statement that life is supposed to go on.